Over on my wife’s blog, she discusses my lack of physical fitness while casting herself in a heroic light. Enjoy. We took on a big project this weekend — ripping out our old sod. There was a clear difference between me and the husband’s fitness levels. Last weekend the hubby and I spent quality time together ripping apart our backyard. Thanks to our dogs, half of our lawn died. The other half succumbed to crabgrass. 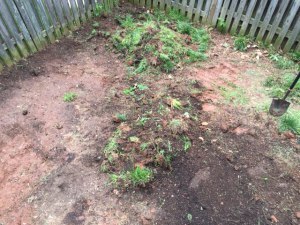 It was time for some old fashion, back-breaking DIY work — digging up the old sod and reseeding the lawn. Initially my plan was simply to replace the brown spots with grass seed and deal with the crabgrass in the fall. It seemed manageable. Well that wasn’t good enough for the hubby. Nope. He wanted to reseed the entire backyard. “Since you’re more fit and healthy, it would be a snap for us,” he assured me.